They are soft to the touch, but surrounded by a hard rough shell. Known as filter feeders, many as small as your thumb, they use their tiny cilia to draw in plankton, sediment and other particles over their gills and spit out cleaner water. They dwell where salt water meets fresh water, and survive in a variety of temperatures from the chilly New England coast to the Gulf of Mexico. And they once played a vital role in New York's harbor providing both a vitamin-rich source of food and a means of commerce and trade. Now, the oyster could have a different role to play - helping clean New York's polluted harbor. These ecological engineers work round the clock filtering water, says Beth Ravit, an environmental scientist and professor at Rutgers University. One little oyster, or mussel, too, can filter up to 50 gallons of water a day. "They literally change, physically and chemically, the system it's a part of," Ravit said. Oysters help get turbidity, or cloudiness, out of the water, thereby allowing sea grass and other plant species to grow. In turn, Ravit said, this puts oxygen into the water, promotes photosynthesis, and creates conditions by which other marine species can survive. Ravit, who works alongside the New York/New Jersey Baykeepers, an ecology advocate group, has been studying oysters, in the Hudson River Estuary since 2006 and says there are spots of populations along the coast, but otherwise they are close to extinct. Once abundant, this bivalve population dwindled in the past century as a result of heavy industrial activity, such as shipping and dredging, as well as overfishing. Oyster larvae seek substrate, or a surface area, to which to attach and search for adult oysters. As they begin to pile up, they form reefs that can serve to protect shorelines by providing wave attenuation and offer other marine plant and animal species places to live in the crevices within its rough hewed shell piles. "They look like the cold water version of a coral reef," Ravit said. "They create a home and a restaurant for other species to live and eat." In the absence of adult shells, or another suitable surface to which to attach, the larvae die off. Over the course of her time with The NY/NJ Baykeepers, Ravit has tested 15 locations in the Hudson River Estuary in an effort to jump-start a viable breeding ground for larvae, but with varying levels of success. "Oysters are sensitive," she said. "They are more susceptible to sedimentation and contamination." Nevertheless, oyster and mussel restoration projects have gained momentum in the harbor. The New York/New Jersey Baykeepers has approximately 30 different partners and has launched six different pilot projects throughout the harbor since 2010, according the Baykeepers oyster restoration program director Meredith Comi. In Manhattan, landscape architect and urban designer Kate Orff is also working on plans to re-introduce oysters to the harbor. 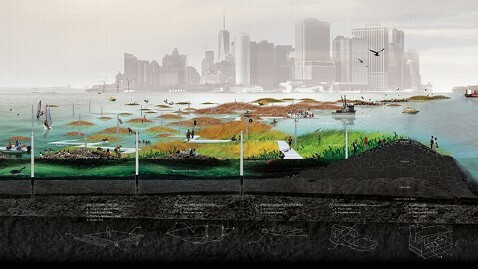 Orff's vision, which she calls Oyster-tecture, appeared 2010 in the Museum of Modern Art exhibit Rising Currents: Projects for New York's Waterfront. It combines the oyster's ecological benefits with elements of design. "Oyster-tecture is about re-making and fabricating habitat infrastructure in cities that can serve jointly to increase biodiversity, but also enhance public space," Orff said. On a recent visit to the downtown urban design firm, Scape/Landscape Architecture P.L.L.C, at which Orff is a principle, she explained her concept as she pointed to colorful renderings on the studio's walls. In one picture, beds of fuzzy rope knitted together create a support structure, one that could hold oysters beds above the siltation layer. The fuzzy rope beds interconnect reef structures made of rock and shell piles. In another rendering, which Orff titled "The New Gowanus," she points out a series of oyster nurseries called Flupsies, or floating upweller systems; they are eight-chambered boxes giving oysters a place to grow out of sight from predators. Strung together, the flupsies form a series of rafts and public walkways providing people with access to the waterfront. For Orff and her team, Oyster-tecture remains a futuristic concept intended to be executed on a large scale, but for now they are testing the idea of it in the coming month at a small site. Her team of designers and volunteers plans to launch a pilot project in the Gowanus Canal, a federal superfund site in Brooklyn, by lowering cobweb-like panels of fuzzy rope into the polluted water within an active industrial zone. "Our plan is to retro-fit a working pier, a pier that is receiving shipments and barged material, with these habitat structures so that we can measure and monitor the rate of mussel growth," Orff said. For this project, she is using ribbed mussels, a bivalve with similar filter feeding capabilities to oysters, but with a higher tolerance for pollution. She plans to monitor the mussels over the next five years, periodically measuring the biomass and taking water samples every few months. There are some Brooklyn residents, like 75-year-old Ron Mehlman, who might find Orff's work beneficial. "I came here 18 years ago when it was almost impossible to walk across the bridge because the smell was so strong," said Mehlman, whose sculpture studio was flooded by the Gowanus during Hurricane Sandy, forcing him to spend the past few weeks cleaning his workspace with bleach and water to mitigate mold and also the smell from the polluted canal. "People should go back and look at Venice, for instance," he said. "How they're coping with it and how they work their problems out." Despite the interest in oyster restoration projects, they also have their setbacks. In 2010, the New Jersey Department of Environmental Protection shut down the New York/New Jersey Baykeepers efforts with two projects, one in the Navesink River and the other in the Raritan Bay, citing concerns about poaching and illegally harvesting oysters from polluted waters and fears that people would, in turn, eat the contaminated oysters. In 2011, however, the New Jersey Department of Environmental Protection, in partnership with the Navy, granted Ravit and her NY/NJ Baykeeper team members permission to renew oyster restoration efforts at a private pier located at the Naval Weapons Station Earle near Sandy Hook, N.J.
Oysters and mussels aren't the only or final answer to cleaning New York's pollution, and for now, Ravit is focusing on finding the right areas in the harbor for oysters to flourish. "We have to get to a critical mass where they can create enough offspring to offset the natural mortality the species would have in the wild," she said. As for Orff, she said rebuilding oyster populations will not only help bring back cleaner water, but will encourage people to re-engage with the waterfront. "The key lesson to Oyster-tecture is that we can start now with readily available materials," she said. "It's played a role in getting people excited again about the harbor as this new front door, or a new kind of Central Park."